The meninges are involved in various pathologies and are often directly or indirectly severed during surgical procedures, especially the dura mater. This can pose a real challenge for the surgeon, as a proper reconstruction of the meninges is important to prevent complications such as cerebrospinal fluid leak (CSF). A variety of techniques for dural reconstruction have been described, employing natural and artificial materials. A novel technique for dural reconstruction involves soft tissue grafts in the form of fibrous or fibromuscular flaps, which are placed on the dural defects to seal the gaps. These soft tissue grafts represent an appropriate scaffold for cell ingrowth and fibrosis, thus preventing CSF. In this pilot study, we described the application of soft tissue grafts for dural reconstruction in 10 patients who underwent convexity meningioma surgery. Witte MB, Barbul A. general principles of wound healing. Surg Clin North Am. 1997;77:509-28. Eaglstein WH. Wound healing and aging. Dermatol Clin. 1986;4:481-4. Aghaloo TL, Moy PK. Which hard tissue augmentation techniques are the most successful in furnishing bony support for implant placement? Int J Oral Maxillofac Implants. 2007;22:49-70. Kempf KK, Seyfer AE. Facial defect augmentation with a dermal-fat graft. Oral Surg Oral Med Oral Pathol. 1985;59(4):340-3. McAllister MS, Haghighat K. Bone augmentation techniques. J Periodontol. 2007;78(3):377-96. Schwartz-Arad D, Levin L. Multitier technique for bone augmentation using intraoral autogenous bone blocks. Implant Dent. 2007;16(1):5-12. Goldstein SA. Tissue engineering solutions for traumatic bone loss. J Am Acad Orthop Surg. 2005;14(10)152-6. Lawrence WT. Physiology of the acute wound. Clin Plast Surg. 1998;25:321-40. Lassen B, Helseth E, Egge A, Due-Tonnessen BJ, Ronning P, Meling TR. Surgical mortality and selected complications in 273 consecutive craniotomiaes for intracranial tumors in pediatric patients. Neurosurgery. 2012;70:936-43. Mordick TG, Larossa D, Whitaker L. Soft-tissue reconstruction of the face: a comparison of dermal-fat grafting and vascularized tissue transfer. Ann Plast Surg. 1992;29(5):390-6. Achauer BM, VanderKam KM, Celikoz B. Augmentation of facial soft-tissue defects with Alloderm dermal analysis. Ann Plast Surg. 1998;41(5):503-7. Komotar RJ, Starke RM, Raper DM, Anand VK, Schwartz TH. Endoscopic endonasal versus open repair of anterior skull base CSF leak, meningocele, and encephalocele: a systematic review of outcomes. J Neurol Surg A Cent Eur Neurosurg. 2013;74(4):239-50. Paek SH, Audu PB, Sperling MR, Cho J, Andrews DW. Reevaluation of surgery for the treatment of brain metastases: review of 208 patients with single or multiple brain metastases treated at one institution with modern neurosurgical techniques. Neurosurgery. 2005;56(5):1021-34. Velnar T, Smrkolj V, Rupnik MS, Gradisnik L. Is tissue augmentation a reality in biosurgery? An experimental study of endothelial cell invasion into tissue filler. Int Wound J. 2013;10(3):321-8. Eppley BL. Experimental assessment of the revascularization of acellular human dermis for soft-tissue augmentation. Plast Reconstr Surg. 2001;107(3):757-62. Richardson M. Acute wounds: an overview of the physiological healing process. Nurs Times. 2004;100:50-3. Attinger CE, Janis JE, Steinberg J, Schwartz J, Al-Attar A, Couch K. Clinical approach to wounds: debridement and wound bed preparation including the use of dressings and wound-healing adjuvants. Plast Reconstr Surg. 2006:117(7):72-109. Broughton G, Janis JE, Attinger CE. Wound healing: an overview. Plast Reconstr Surg. 2006;117:1-32. Strecker-McGraw MK, Jones TR, Baer DG. Soft tissue wounds and principles of healing. Emerg Med Clin North Am. 2007;25:1-22. Sawaya R, Hammoud M, Schoppa D, Hess KR, Wu SZ, Shi WM, et al. Neurosurgical outcomes in a modern series of 400 craniotomies for treatment of parenchymal tumors. Neurosurgery. 1998;42(5):1044-56. Horowitz G, Fliss DM, Margalit N, Wasserzug O, Gil Z. Association between cerebrospinal fluid leak and meningitis after skull base surgery. Otolaryngol Head Neck Surg. 2011;145(4):689-93. Kelly DF, Oskouian RJ, Fineman I. Collagen sponge repair of small cerebrospinal fluid leaks obviates tissue grafts and cerebrospinal fluid diversion after pituitary surgery. Neurosurgery. 2001;49(4):885-90. Dusick JR, Mattozo CA, Esposito F, Kelly DF. BioGlue for prevention of postoperative cerebrospinal fluid leaks in transsphenoidal surgery: A case series. Surg Neurol. 2006;66(4):371-6. 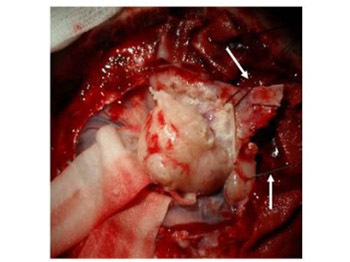 Kitano M, Taneda M. Subdural patch graft technique for watertight closure of large dural defects in extended transsphenoidal surgery. Neurosurgery. 2004;54:653-61. Monaco JL, Lawrence WT. Acute wound healing: an overview. Clin Plast Surg. 2003;30(1):1-12.